An integral part of any yoga flow, Downward Facing Dog Pose is one of the most restful poses we come to again and again during practice, second only to the sweetly restorative Child’s Pose. It offers us a moment of respite from an otherwise intense flow, but it can also be perfected as a powerful pose in its own right. Given that it is one of the most common poses we encounter in most yoga classes in the West, it is often assumed that each of us knows how to do it with complete confidence and perfect alignment; however, that is not always the case. It is often the seemingly simple poses that we struggle to perfect because of that very fact – they seem almost too simple. Contrarily, when poses are more challenging, we pay greater attention. An in-depth exploration of this pose can offer us insights as to what this pose is all about and how we can perfect it, as simple as it may seem. Downward Facing Dog (often shortened to Downward Dog) is the pose in which the body takes on an inverted “V” shape. Hands and feet are planted on the floor as the tailbone reaches up towards the ceiling. As mentioned, it’s an integral part of any Vinyasa Flow, showing up as a rest pose in the midst of more fluid sequences. This asana is also one of the twelve postures of Surya Namaskar, or Sun Salutations. As such, it is a prostration, which means, “to bow down” to prana or to life force. Each pose in the traditional Sun Salutation sequence is associated with a mantra, giving a little more depth to the meaning of the pose. The mantra paired with Downward Dog is “om maricaye namaha,” which means “salutations to the Lord of the dawn.” This pose is therefore directly tied to reverence of the sun. There are a few ways to come into Downward Facing Dog, with entry points that include Child’s Pose, High Lunge, Table Top, and Standing Forward Fold. Once you are familiar with one method of coming into the pose, entrance into it from the others will become intuitive. Focus on alignment and then allow your flow into this pose to unfold naturally. Begin in Table Top position. Hands are directly beneath your shoulders on the mat and knees are directly beneath your hips. Your back should be parallel with the floor and fingers should point forward. Spread your fingers wide and press through the entire surface of your hands. Tuck your toes in preparation to push up off the mat. On an exhalation, push back to lift your knees off the floor. Your tailbone reaches up towards the ceiling. Draw your sit bones towards the back wall while keeping a slight bend in the knee. The legs should be straight but the knees unlocked. Pull up through the pelvis as you lengthen your spine. Press through your heels and hands in equal measure, engaging quadriceps and arm muscles. Draw your shoulders away from your ears as if guiding them in the direction of your tailbone. Your chest pushes softly towards your thighs as you press into the mat. Thighs turn inwards slightly as you continue to draw your sit bones upwards and back. Relax your head without letting it hang loose; the neck should be aligned with the spine. There are a few possible modifications for this pose. If there are any challenges with comfortably maintaining proper alignment when in Downward Facing Dog, these variations can act as preparatory poses. Find an open wall and place your palms upon it, hip-distance apart and somewhere between shoulder and elbow height. The higher they are the less of a stretch this pose will put on the body. Press through the fingers and palms as you step back slowly to elongate your spine directly behind you. The crown of your head comes towards the wall and your hips extend away from it. Once you have stepped as far back as is comfortable, find stillness in the pose. Keep the head aligned with the spine. Hold the pose for 30 to 60 seconds and step forward slowly to come out of the pose. Beginning in Table Top position, place one block beneath each hand and press into them as you tuck your toes in preparation to push back. As you push back, bringing your knees off the mat and drawing the tailbone up and back, press into the blocks for support. Navigate towards proper alignment while finding support through the added height provided by the blocks beneath you. Allow the shoulder blades to pull back from the ears and the spine to elongate. Keep the knees unlocked as the legs straighten. Find stability as you disperse your weight through your palms and heels. Hold this pose for 30 to 60 seconds to start, extending the duration as you become more comfortable with the pose. Begin in Table Top position with wrists beneath shoulders and knees beneath the hips. Tuck your toes and walk your hands forward half a foot. Draw your tailbone back, buttocks coming towards your heels but never reaching them. Stretch the arms forward, keeping them engaged. Your forehead can come to rest on the mat gently. Feel into a stretch of the spine, pressing through your arms while your hips pull back. Breathe through this pose for 30 to 60 seconds and then release by finally allowing your buttocks to rest on your heels. Transition into Child’s Pose. Downward Facing Dog Pose has numerous benefits. It engages the entire body, promoting health in a multitude of ways. On a physical level, this pose can help to energize the body, strengthen the shoulders, arms, legs and back, improve digestion, reduce fatigue, and relieve certain types of back pain. On an energetic level, Downward Dog relieves stress and calms the mind. It is associated with the throat chakra, also known as Vishuddha and may help to balance energy flow within this region of the body. When the throat chakra is balanced, we are able to clearly communicate and express ourselves. Our inner truth and creativity flows freely. There are certain conditions contraindicated with every pose. Downward Dog may not be suitable in cases of high or low blood pressure, acid reflux, history of stroke, late term pregnancy, and carpal tunnel syndrome. It might also not be suited where there has been wrist or shoulder injury as it applies pressure on these joints. Use caution when a headache is present, opting for a head-supporting pose like Puppy Dog Pose. When starting any new exercise or other physical practice, it is important to consult with a physical healthcare practitioner to ensure that what you are opting for is suitable for your body and any preexisting conditions. In cases of contraindications, there may be modifications that make a pose safer and more accessible for your present needs. 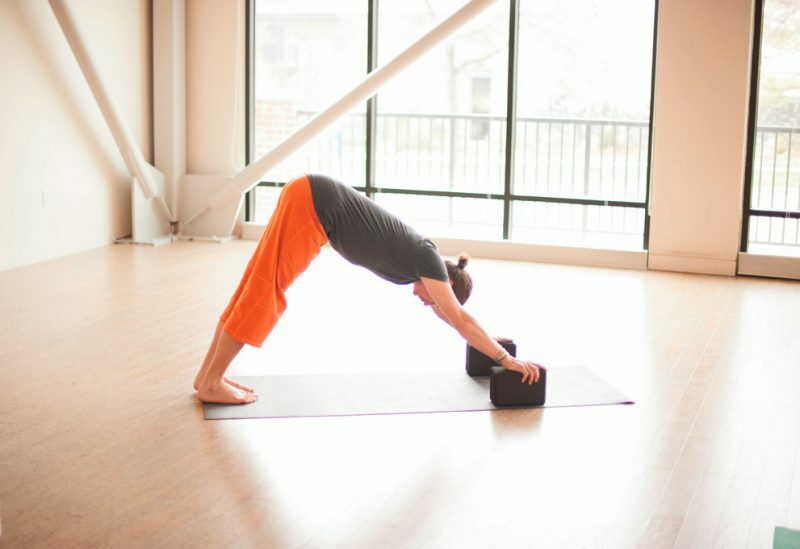 Downward Dog fits nicely into even the shortest practices. This daily sequence can be incorporated into your day if you have even just five minutes to spare. Begin in Child’s Pose, buttocks resting on the heels and knees about hip distance apart. Your torso falls overtop of your thighs and arms extend ahead of you. Forearms and forehead rest on the mat. Tuck your toes and engage your arms, inching your hands a little bit closer to your shoulders. Plant your palms and spread your fingers wide. Press into the entirety of your hands as you push through your tucked toes to raise your knees off the mat. Come into Downward Dog position by extending the tailbone up towards the ceiling. Draw it gently towards the back of the room as you elongate the spine. The legs should be straight but knees unlocked. Press evenly through your hands and heels. Draw your shoulders away from your ears, feeling the chest open slightly. Hold for 30 to 60 seconds. Bend the knees slightly and step forward, one foot at time, so that your feet come between your planted hands. Extend your legs once more while keeping them unlocked. For proper alignment in this Standing Forward Fold, ensure that your lower back is straight by bending at the hips rather than through the waist. Your hands may not reach the floor comfortably; this is entirely okay. Allow the hands to fall where they may. The head hangs comfortably. Hold for 30 seconds. Come to Raised Hands Pose by bending the knees on the inhale and stretching your arms in front of you or along your sides until the reach towards the ceiling. The buttocks should be tucked slightly and the shoulders relaxed. Fingertips reach upwards and palms face one another. Gaze forward and hold for 30 seconds. On an exhalation, bring your hands down and into a prayer position at the heart. This is known as Anjali Mudra. Take a moment here to give thanks for this short and sweet practice. Hold in stillness while focusing on the breath for another 30 seconds. Release when you are ready. Downward-Facing Dog Pose may be a simple pose but it has a huge impact. Having an incredible strengthening and stretching effect on the physical body while also helping to relieve stress and fatigue, Downward Dog is a perfect asana to incorporate into daily life. Even when we’re busy, it is always possible to find five to ten minutes to move through a simple yoga sequence that includes this powerful pose. Use Downward Dog to show reverence for the sun, either at daybreak or at day end, or simply practice this pose as a means to bring about greater strength, a deeper stretch, or a sense of inner peace.